Number 1 on my December Goals list was to choose a word/theme for the new year. 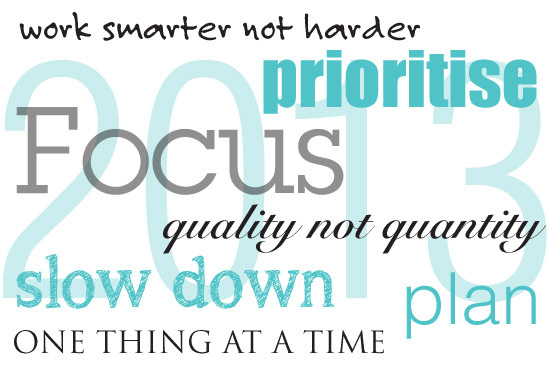 My word for 2013 is Focus. 1. An act of concentrating interest or activity on something. 2. To see things more clearly. Over the last fifteen months since I have gone from working full-time to working part-time I have had more time to spend with family and friends, time to develop my interests and more time to relax. This has made an amazing difference to my family life, my social life and my general health and well being. However, I still have a busy life and often feel overwhelmed by it. My family and friends are always a priority and will continue to be so. THANK YOU all for inspiring me and supporting me over the last few months. Starting this blog (although time consuming) has been a great adventure. I enjoy interacting with readers and I find blogging a great vehicle for my personal development. Thanks also to Tammy Strobel of Rowdy Kittens for inspiring me to choose a word/theme for 2013. Do you have a word/theme for 2013? How do you find focus when life is busy? What are your dreams for next year? Those are wonderful objectives that you listed for 2013. I can say that focus was the word for me in 2012 and by being very focused I really did accomplish a lot of positive things. I'm now thinking about what I want to see happen in 2013 and it isn't completely clear yet. I do know I want to be able to save 50% of my after tax income so that is a big and long term goal. A couple years ago I picked a word for the year too and it was a great way to focus myself. I hadn't thought about 2013 - thanks for the reminder. I must start pondering . . . hmmm. Meanwhile, I'm hoping to do some freelance writing as well. And more downsizing too. Reduce my wardrobe to just the things I wear and love. Plus I need to tackle some closets around my house. We have a big storage closet in the basement where I still have some of my childhood dolls! Oh dear! But my grandma gave them to me and they're in such beautiful condition . . . blah, blah, blah.